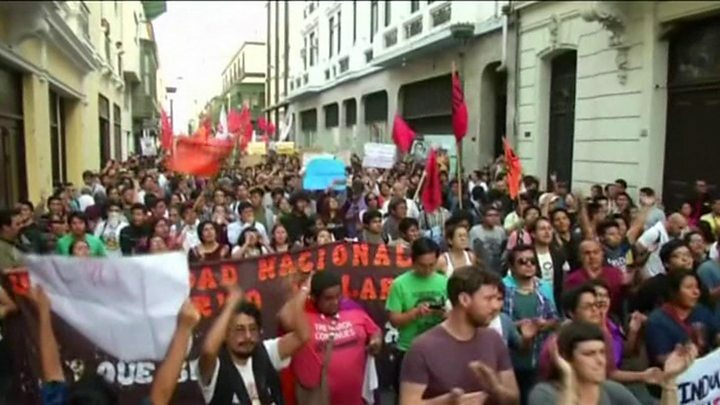 “No to the pardon!” chanted crowds in the capital Lima, during a second day of unrest that began on Christmas Eve. President Pedro Pablo Kuczynski pardoned Fujimori on health grounds. Mr Kuczynski acknowledged the anger at his decision but said he could not “allow Alberto Fujimori to die in prison”. The former president has low blood pressure and an irregular heartbeat. Mr Kuczynski denies pardoning Fujimori as part of a deal with his party last week to avoid his own impeachment, for allegedly receiving illegal payments from the Brazilian construction giant Odebrecht. On what grounds was he pardoned? In a following statement, Mr Kuczynski said: “I am convinced that those of us who consider ourselves democrats cannot allow Alberto Fujimori to die in prison. Justice is not vengeance. All pardons are by nature controversial. There is an important number of Peruvians who are opposed [to the pardon]. In 2007, he was sentenced to six years in jail for bribery and abuse of power, but two years later was sentenced to another 25 years in prison for human rights abuses committed during his time in office.